From starter home to dream home, from beach cottage to mountain retreat, Tidewater Custom Modular Homes gives you the choice of styles and floorplans to make it one of your dreams. For specific information, call or text at (757) 296-2217. We can help you customize any floorplan to meet your specific taste and needs. 3 BEDS, 2 BATHS, 3384 SQ.FT. The stately exterior of this home is eye-catching for passersby. Upon entering through the front door, the openness of the plan and the sheer size of the first floor living area are striking. From the open kitchen, breakfast nook and living room area to the master bathroom with tiled shower and tub, this plan does not disappoint. The upstairs can be finished with a massive great room area in addition to two more bedrooms and a full bath. There is so much room packaged so well in the Ashton. 3 BEDS, 2.5 BATHS, 2239 SQ.FT. The unique features of this single-level 2,239 square foot home make it a must-have. The master bedroom features a tray ceiling and sitting area. The large walk-in closet and tub/shower combo complete the master suite. Two additional bedrooms and a bath complement the opposite end of the home. The kitchen is complete with nook, and an enclosed utility room opens off of the two-car attached garage. To finish off the floorplan, a formal dining room and large great room have been added. 5 BEDS, 5.5 BATHS, 5707 SQ.FT. The ‘open-to-above’ foyer provides the perfect entrance to showcase the magnificence of this 5,707 square foot home. Flanking the foyer is the study and the home’s formal dining room. The spacious kitchen, breakfast nook and family room flow together perfectly and offer the ideal setting for entertaining. The sunroom and secluded fourth bedroom complete the first floor layout. The master suite and a generous bonus room highlight the second floor. The home’s three additional bedrooms complete the upper level. 3 BEDS, 3.5 BATHS, 3383 SQ.FT. The Chadwick is a classic Excel – Modukraf Homes Estate model. 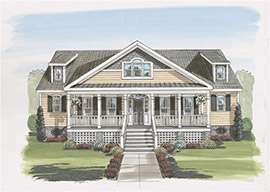 The 3,383 square foot two-story plan offers a butler’s pantry, a 19-foot open-to-above foyer and a sunken family room, which are just a sampling of the unique features of this home. The wrap-around porch on the exterior of the home creates a welcoming feeling that is hard for anyone to resist. 2 BEDS, 1.5 BATHS, 3154 SQ.FT. 4 BEDS, 3.5 BATHS, 3415 SQ.FT. This 3,415 square foot, two-story Cape plan consists of a master suite and three additional bedrooms, two on the first floor and two on the second level. The master suite features his and her walk-in closets and a large private bath. The kitchen has a large breakfast nook and attached formal dining room. To complete the first floor, HCH has added a large great room that is open to above, a living room, a utility room and two baths. The second level has the home’s fourth bath and opens to the lower level.